Is Tornado Alert a weather radio? Tornado Alert is not a weather radio, it uses direct detection technology and operates independently of the National Weather Service and the NOAA Weather Radio system. On numerous occasions casualties have sadly occurred due to having no warning. This is because in these instances commercial infrastructure has been destroyed by storms rendering the NOAA Weather Radio system transmission network useless. Additionally, there are geographic locations where currently there is no signal for the NOAA Weather Radio system and gaps in the National Weather Service Nexrad radar system. Before relying on the NOAA Weather Radio transmission network, users are urged to check the NOAA Weather Radio system Outage website www.nws.noaa.gov to insure the NOAA Weather Radio system is functional for a given area. Next, the Nexrad radar outage site should be checked weather.noaa.gov to insure radar functionality. Of course these checks require power and internet connectivity, which is not always reliable during storm conditions. Again, Tornado Alert operates independently from the National Weather Service and the NOAA Weather Radio system. How does Tornado Alert detect a tornado? Tornado Alert is a receiver tuned to detect low-grade radiation emitted by storms in the same manner as the many networks currently in operation (i.e, NASA LMA, Los Alamos LASA, Stanford VLF AWESOME, Duke University VLF array, Langmuir Labs, Vaisala, Earth Networks) except Tornado Alert is a single station device intended for residential use instead of an incredibly expensive multi-station array for use by the government. The device measures the amount of electric energy in the atmosphere to determine storm intensity in a similar manner to those organizations listed above, identifying low intensity Lightning storms, non severe storms, Severe Thunderstorms (as defined by the NWS), immediate risk of tornado formation and tornadoes. For more details on technologies using these principles by NASA see the youtube video at youtube.com. What is the science behind Tornado Alert? Over the last 40 years some of the best scientists and physicists in the world have proven that tornadoes are formed using the theory of Magnetohydrodynamics, resulting in NOAA and NASA to spend $11billion on getting the new GOES-R satellite ready to be put into Earth’s orbit to improve detection of electrical based weather events, including lightning and tornadoes. Tornado Alert is an independent device that detects the specific frequency emitted when a tornado is formed like NOAA/NASA GOES-R satellite, thus detecting an event and using the strength of the signal to detect proximity. However, it does so from your exact location. There are numerous studies on the subject, and given the failure of Doppler Radar to cover the USA properly, it is no surprise that NOAA are desperate to implement this new technology. When air rotates with dust or water particles it becomes electrified. This has been proven over and over again, for example, Philip Lenard Nobel Laureate from 1905 studied this phenomena extensively and the effect was named after him – the Lenard effect (also known as the spray electrification effect). This electrical charge can be measured and has been studied extensively by NASA. There is great concern about this phenomena for Martian astronauts. See the video NASA MATADOR Electrified Tornadoes www.youtube.com. So all rotating air, even very slow rotations of dust devils, generate electric charge. Is there always lightning? Well, there are different kinds of lightning. Most people are familiar with cloud to ground lightning which is the most powerful and causes great thunder claps. There have been many studies over the past half century showing that there isn’t always enough charge generated to create cloud to ground lightning with tornadoes – there is very little correlation between tornadoes and cloud to ground lightning. In fact some studies show that lightning holes, areas of very little cloud to ground lightning, are created when tornadoes form. Then there is cloud to cloud lightning or intercloud or intracloud lightning. This type isn’t always visible during the day and may not generate a thunder clap. There is always some amount of detectable electrical activity present regardless of whether it is visible or not. Then there are the other forms of radiation generated by storms – gamma rays and positrons – that aren’t visible but emit detectable VLF radio signals. Tornado Alert is testing the electrical charge density in the atmosphere for tornadoes, not the discharge counts of lightning. 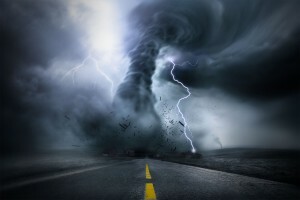 What is the future of tornado detection? There are only two answers – satellite and inexpensive smoke detectors style devices like Tornado Alert in every home. All future technologies being introduced in the next decade REQUIRE 1 minute or less scan resolution times. The TAU offers the superior scan time today. The current Doppler technology has a 4-6 minute resolution time and there is no fix to the distance between radar stations – especially if a radar site goes down or is evacuated. Why don't I just use a weather radio? Sadly, weather radio suffers from several problems. Firstly, the reports are not localised to your exact location. Secondly, the alerts are often delayed by 5-10 minutes. Thirdly, by NOAA and NWS own admission alerts are false alarms 75% of the time. Fourthly, in the event of power outage, cell tower or radio tower failure, a weather radio based warning may not be delivered, thus nullifying a weather radio. Fourthly, in a storm with severe electrical activity radio frequencies can be impacted so reception is lost, thus, your warning will not arrive, especially at night when visibility is lost. Fifthly, NOAA with NASA by their own admission are using outdated technology to detect tornadoes and existing infrastructure does not cover the entire United States, hence they are spending over $11b to replace outdated, inaccurate doppler radar. The technology they are using have the same fundamental technology as Tornado Alert as they see this as the most accurate way to detect severe weather, lightning and tornadoes. Comparing a radio with direct detection technology, the workings are simply not comparable. The only outcome is the only important factor and the NOAA weather radio is subject to false alarm, inaccurate warning and often total failure. Tornado Alert is localised, proximity based direct detection technology. Why don't I just use a free weather app? The same problems that result in failure for weather radios apply for mobile phone apps, this is because the information being delivered to the app comes from the same source as NOAA weather radios. The number of false alarms, the lack of coverage from NEXRAD Radar and the failings of existing warning infrastructure result in the first problem where a phone app, like a weather radio may not even detect a tornado. Then there are the issues of delivery, in the event of power outage, cell tower or radio tower have been know to fail, meaning a weather app based warning may not be delivered, thus nullifying any potential warning. Additionally, in a storm with severe electrical activity radio frequencies can be impacted so reception is lost, thus, your warning will not arrive. On many occasions both a weather radio and phone app will of course work, however, can not be relied upon to successfully detect danger every time in you exact location. Tornado Alert is localised, proximity based direct detection technology and provides cover where existing systems are prone to fail. Why is Tornado Alert nearly $100? Tornado Alert is a PATENTED scientific instrument with a built in processor and memory.You can’t patent a radio or a lightning detector. Inside the box is in effect a computer connected to an antenna that is constantly listening to atmospheric radiation and running thousands of calculations to detect a range of electromagnetic signatures to identify several types of threats, then running calculations to accurately approximate the distance of the threat in relation to your exact position. This equipment is not comparable to a weather radio, which do not use Ragel State machines or sub-millisecond sampling rates – all of which consume processor cycles. Tornado Alert, unlike weather radios employ sub-harmonic filters and has to use EMF rejecting power supplies. The Stanford VLF Group AWESOME receiver uses multiple second sampling and can’t be placed in the home – and costs $3000! Tornado Alert is the product of a life work by Richard Carlisle. In the 1950’s and 1960’s, while radar was still principally a military technology being converted to civilian weather use, the development of the technology and theoretical basis of the electrical nature of storms reached a zenith. In 1969, an article in both Popular Science and Popular Mechanics describing a technique using TV detection of tornadoes developed over 12 years by an electrical engineer named Newton Weller captured his interest. The Weller method was supported by Dr. Hubert L “Tornado” Jones, developer of the original sferics detection network in Oklahoma, the Argonne National Lab, Alan Pearson Director of the NSSL and Biggs and Waite Climatologists for NOAA who sponsored a successful published statewide evaluation of the method in Iowa in 1970. While the success of the Weller method was irrefutable, it was believed that RADAR would be more successful, even though no evidence supporting that faith existed at that time. In 1971, prior to Ted Fujita’s publication of the tornado rating system of the same name, Richard began investigating the questions raised by researchers over the previous decade that were re-iterated in the popular magazine’s articles – was the Weller method using the most reliable frequency, could the range be extended, what were the exact physical processes responsible, how well correlated were the measured phenomena? Using off the shelf technology over the 1971-1973 period more than 100 samples of severe events and tornadoes were collected. Working with Bob Ferry Chief Meteorologist in Charge of the Birmingham Weather Field Office, storm reports, radar imagery and other supporting evidence was collected and presented to four NASA scientists from the Marshall Space Flight Center in Huntsville Alabama in April of 1973. Richard received an Outstanding Achievement in Science award from Dr. Rocco Petrone Director of the MSFC at a dinner held at Samford University. Development and collection of data continued through out 1974, the year of the Super Outbreak of Tornadoes (still considered the largest outbreak in recorded history) and in 1975 Bernard Vonnegut who published the original Electrical Theory of Tornadoes and Otha Vaughn of the MSFC published their account of tornadoes recorded in Huntsville Alabama by NASA scientists and others supporting my findings. Otha Vaughn sponsored the Mesoscale Lightning Project proving that lightning extended to upper regions of the atmosphere that was dismissed by meteorologists for decades and was finally proven by photographic evidence in 1989. In spite of hundreds of documented cases reported by professional pilots, meteorology insisted this phenomena wasn’t real and could not happen. Richard developed the computer algorithms at the Rust Research Center from 1975-1976 using an IBM 370/158 and converting the data collected to that point to a digital format necessary for programming. In 1974 the use of AM radio broadcasts was first used – and the limitations of the centralized strategy of transmitting data to a central location for computer processing and subsequent re-transmission of results to the public became painfully obvious. Not only were inherent delays in this process unacceptable, but the lack of reliable reception by the public desperately needing the information in a timely fashion was simply unreliable. It was at this time that the distributed strategy, putting the detection and analysis technology in each home like a smoke detector, was conceived. Unfortunately, the computer technology required by the distributed strategy of placing an appliance in the home simply didn’t exist. In May 24 1973, the first successful detection of a tornado by Doppler Radar was made. After 10 successful detections, two of which were unconfirmed, the national commitment to deploy Doppler radar and the NEXRAD network was announced in the Joint Doppler Development (JDOP). Everyone, including Richard, believed this was the answer and further development of the technology based on electrical energy was suspended. However, an understanding of the physical processes of the natural phenomena continued. The Nobel Prize awarded in Chemistry to Ilya Prigogine and his published work on chaos and dissipative systems revealed the shortcomings of the mainstream weather theories based solely on an understanding of thermodynamics from the 19th century. Publication of the Magnetohydrodynamic Theory of Tornadoes, based on Nobel Laureate Hannes Alfven work, established alternate theories capable of accounting for the electrical nature of storms being dismissed to that point, just as the lightning discoveries now known as Sprites, Elves and Blue Jets had been dismissed before irrefutable evidence was provided. NASA deployed equivalent technology, the Radio Plasma Wave Science (RPWS) on Voyager, Galileo Jupiter Probe and Cassini Saturn spacecraft over the period from 1977 to 2010 to study the electrical nature of storms throughout the Solar System. NASA conducted measurements of the electrification of atmospheric vortices (dust devils) in the early part of the new millennium. But the essential technology required for an inexpensive residential application still didn’t exist. By 2010, Doppler radar was failing to realize the potential of its original hope, and cell phone technology development advancements had produced powerful computer chips at low cost – exactly what was required. NASA had continued development of Lightning Mapping Arrays using total lightning instead of just the cloud to ground activity that was the focus of development in the late 80’s at NASA Kennedy when Richard was assigned there. Total lightning activity and effectiveness was well established and the physics well understood (assisted by Doppler radar imagery) and the original research from the early 1970’s was vindicated. Even the Lighting Mapping Array operated by NASA Sport is available now on a single computer chip (since 2011). Once the advanced computer chip technology was available, and the unresolvable physical limitations of Doppler radar became obvious and beyond dispute, there was only the matter of replacing the data from the 1970’s that had become un-useable as the magnetic media degraded. On April 27 2011, by random chance, that opportunity was provided as a prototype of the original equipment captured data from Tornadoes within range that replaced 6 years of previous research in a single day with an historic tornado outbreak rivalling the Super Outbreak of 1974. Results presented to John Copenhaver, former Area 4 Director of FEMA led to an introduction to Early Alert, an Emergency Management and business continuity company specialising in weather based threats. Meteorologists for Early Alert recommended development of prototype hardware and a Validation Project, funded by Home Depot, collecting data from over 100 locations around the country, proving the concept in 2012. The production Tornado Alert was developed as a result of 45 years of research and validation. After many delays, GOES-R Successfully Launched November 19 2016 at 6:42PM EST and is currently in orbit. How can the tornadoAlert be effective when it's so small? Technology miniaturization has reduced the size of computing footprints by a factor of several orders or magnitude over the past half century. A cell phone now has 10,000 times the power of the computer on Apollo 11 that landed man on the moon. There are applications available for cell phones capable of detecting gamma ray radiation produced by storms. The circuitry of a single sensor of the Lightning Mapping Array (LMA) is available on a single chip now (2011). However, some components can’t be reduced in size, which is why the tornadoAlert is the size that it is. The antenna is a fixed size, determined by the physics of the wavelength of the radiation being detected and is considerably larger than a cell phone antenna. Components can’t be placed too close together, such as the strobe, or electrical noise becomes an issue. The requirement for a 9volt battery and its ability to provide the necessary electrical current, and some of the capacitors being used are just some of the basic engineering requirements that determined the physical size of the product. The science of Magnetohydrodynamic Tornadoes was first theorised in the 1920s. Over the proceeding decades, research has been undertaken at many of the world’s leading universities and also NASA and NOAA, resulting in the discovery of frequencies that are emitted from tornados when formed. Remarkably, it was in space where the tweaks, chorus, whistlers, auroral kilometric radiation, and comparative measurements from Neptune, Uranus, Jupiter and Saturn, including the most powerful storm ever recorded in the entire solar system by Cassini at Saturn were discovered. The most devastating effect of electrical storms, including tornadoes, is the electrical blackout that occurs in the heart of a storm, rendering traditional warning technology useless. Radio and cell signals are disrupted due to immense electromagnetic interference, and often power lines are ripped up by tornadoes taking out the power grid, thus causing a loss of power for televisions, internet and methods of alert that depend on a connection to the world. Tornado Alert detects the electromagnetic frequencies directly and has a battery backup in case of loss of power. Based on over 40 years of scientific research, Tornado Alert is the world’s first personal tornado, lightning and severe weather detector. 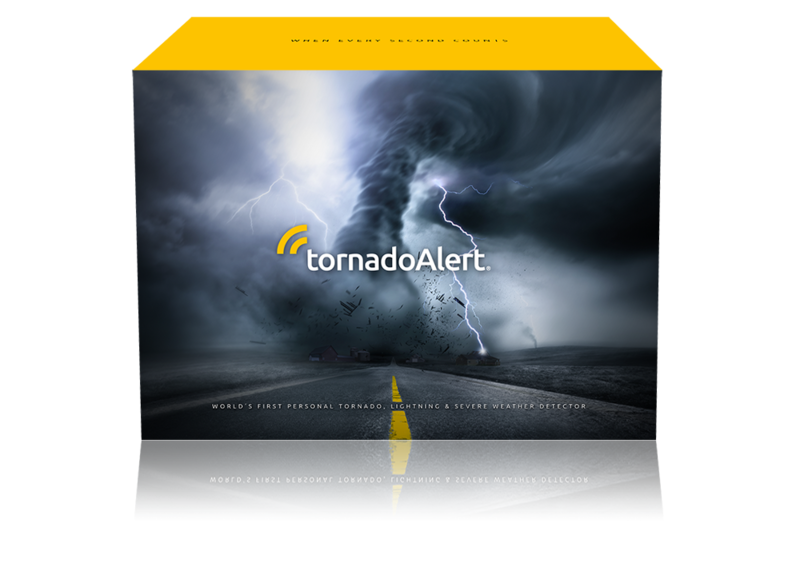 With 95 percent accuracy, Tornado Alert will warn you faster than any weather radio or news broadcast. Where existing alerting and warning technologies that rely on radio, internet, TV broadcast or SMS messages typically fail, for example in the event of a power cut, loss of cell coverage or electrical interference, common side effects of electrical storms, Tornado Alert continues to monitor the proximity of danger to your exact location.